Ravens Challenge is the largest single Counter Improvised Explosive Device (C-IED) for Explosive Ordnance Disposal (EOD) training exercise in the world. In September 2016 it was held in Hua HIn Thailand. 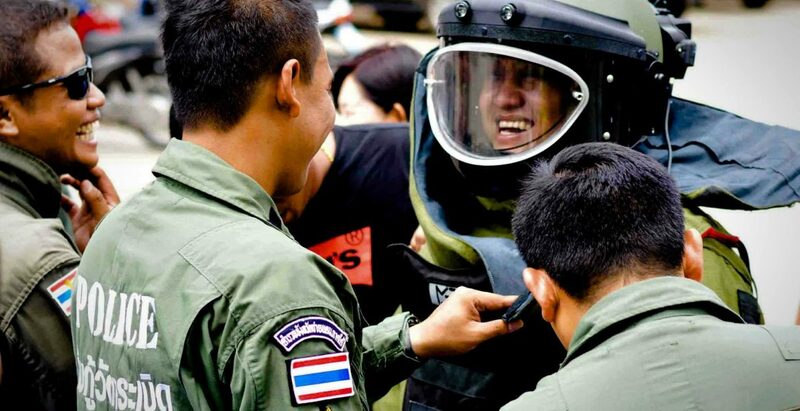 We have had the priviledge to interview the Ravens Challenge Director Al Johnson, former US Army EOD Commander, and current advisor to the Royal Thai Police Unit 191 (EOD). Mr Johnson would you briefly analyze for us , the critical local, regional and strategic factors in Thailand, the nation, in fact coupled with the whole Asia, it’ s becoming more and more crucial. On October 13th the King Bhumibol Adulyadej died, do you have already a personal idea of the political and military future of the nation? Thailand has long been a central point of importance in the South East Asian region. For most of the last century, it functioned as a buffer zone between the French and British Empire, and most of the latter half of the 20th Century as a buffer between communist and democratic governments. With 80% of global trade and almost a quarter of the worlds population located in the South East Asian Region, Thailand stands as a critical central point to ensure stability that has global implications. With the transition in Thailand it raises the potential that instability might be exploited by various political and terrorist groups. Already in Indonesia and Malaysia Da’esh (euphamistically called ISIS) has established a presence. These more violent radical groups threaten to link up with the insurgency in Southern Thailand and could escalate the violence so that it breaks out of the traditional borders in Yala, Narathiwat, and Patthani. Thailand must maintain a stable governance and security presence during the transition period and afterward to ensure that the transition is not exploited by Da’esh and groups similar to either conduct indipendent operations or to link up with existing insurgency groups. Further complications arise when we factor in Chinese expansionism and the push to coopt Thailand to become more aligned with Beijing. Recent joint moves by factions in the Thai government indicate that China will also be looking at the transition period as a potential to exploit to their advantage. However, these challenges mean that Thailand will be continuing to accelerate its modernization programs. It already has one of the largest EOD structures per capita both civilian and military in the world, and has to continue to develop capability not only for low intensity warfare, but for the regional power conflicts that might develop. So a mix of conventional and non conventional equipment and structure is needed. Mr Johnson what ‘s the RAVENS “ Challenge” in the military and civilian world ? For us, it has always been about presenting a realistic, large scale, multi-agency, multi-jurisdictional training event in order to provide the commanders, government officials, and public safety personnel with the most accurate information and training to be able to deal effectively on a local, national, and regional level with IED and other explosive hazard threats. 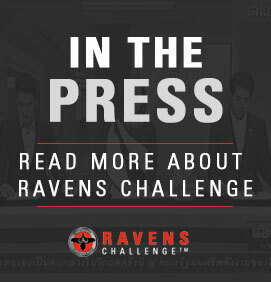 Ravens Challenge enables units to develop skill sets to deal with the current and future IED threats and work with partner agencies both police, military, and private, to reduce the effectiveness of IED threats and maintain public safety and security. Where the event is yearly hosted and facilitated? The biggest event, the “World Cup” of Ravens Chalenges if you will, is held in Thailand every year, and co hosted by the Royal Thai Police. We also host smaller local and national Ravens Challenges wherever a need arises. These serve to help focus on local and national interagency skill development and cooperation, then from these teams and commanders can participate in the larger regional and global Ravens Challenge to develop the working network and cooperation to combat the IED threat. Are the teams national or international ones? Both. But its not only EOD teams. K-9, SWAT, Intelligence, Forensics, Medical Support for Blast Trauma, Chemical Threats, etc. they are all incorporated as each scenario that is provided requires EOD teams on occasion to integrate and use supporting departments. Mr Johnson, do u think the Maritime C- IED response is going to face new challenges in the future? Absolutely. As the LTTE ( Tamil Tiger ) rebels in Sri Lanka proved, a small insurgency equiped with maritime IEDs can inflict damage and casualties that no one though was possible without a state funded navy. That was 10 years ago. The technology and knowlege base has expanded and now with drone technology and improved off the shelf components, insurget groups can utilize the maritme IEDs to disrupt maritime commerce and soverignty. And depending on the region and intensity, a maritime IED insurgency can have a greater impact than a ground based IED insurgency upon a nation. Ravens Challenge this year recreated many of the LTTE devices and began to educate EOD teams an others on the potential threat and assist in developing response protocols and intelligence gathering and exploitation frameworks for this maritime threat. It is always fascinating to see “what next”. We have already seen drone dropped IEDs in Syria. Drone “Kamikaze” bombs. Remote Control Car bombs. Early attempts at chemical devices. Improvised Rockets. The ability for insurgent and terrorist groups to utilize effective IEDs increases daily thanks to the internet, and as new ideas are tried and shared, groups become more effective. This is why military and public safety must always be not only training for the current threat, but monitoring what is being tried worldwide, and train on defeating it. Personally I see drone IEDs and IEDs dropped from drones as being a new wave of attacks as drones become cheaper, the range longer, and the ability to carry payloads increases.